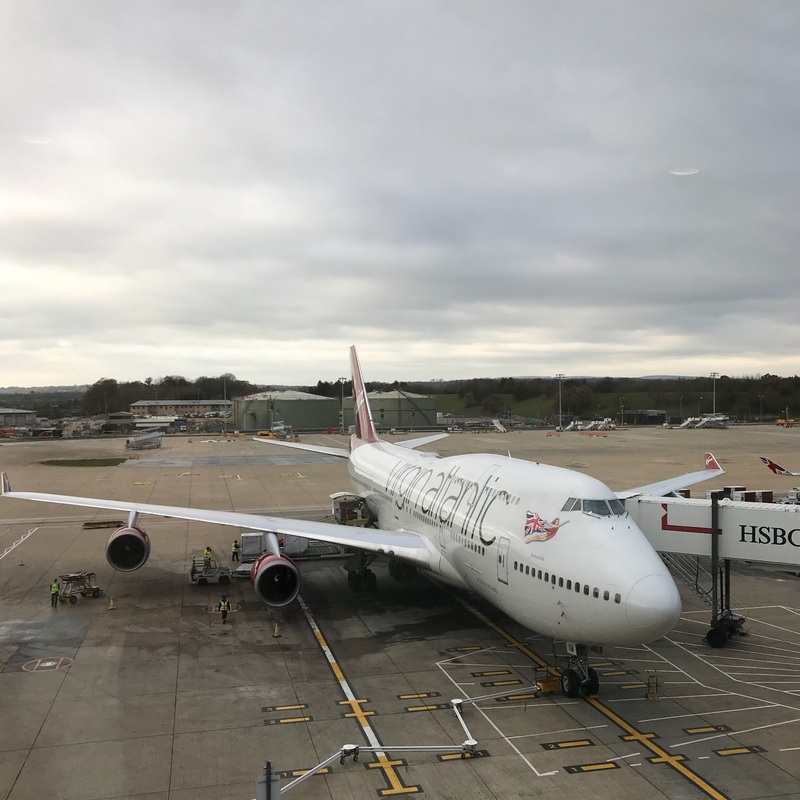 I love to travel, it's definitely one of my absolute favourite things in life and as long as I can remember I've enjoyed every holiday, oh apart from that one time I was forced to go camping as a young child and forever declared that I'd rather stay home than go through that again. I can't remember exactly when 'flying upper class' was added to my bucket list but I do remember the desire hugely increased as my trips to America become more frequent, not having a money tree at the end of the, umm kitchen, because I have no garden haha, means that the majority of my flights have always been in economy and a couple in premium economy but never my much longed for upper class, every time I walked onto that plane I dreamt about turning left and finally when I flew to Orlando in November for my Christmas WDW trip one of my biggest bucket list items happened thanks to the Virgin Atlantic Flying Club miles I'd been saving up. The benefits started from the moment I checked in, my boarding pass was handed to me with one of those glorious silver 'premium Gatwick' stickers that mean you aren't going to take 15+ minutes to get through airport security but you're through within 5 minutes, if that, thanks to a separate section which had absolutely no waiting, I had used this before as Virgin Atlantic had kindly stuck the lovely sticker on a boarding pass in the past as a kind gesture and it's a great benefit. 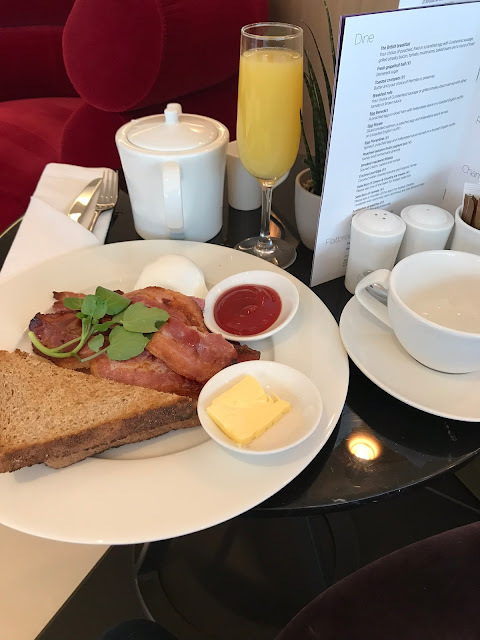 Usually once threw security I'd go straight for food at which ever restaurant was offering a fry up and not overly busy, however today I had access to Virgin Atlantic's clubhouse and I couldn't wait to get in there and enjoy a more relaxed and peaceful couple of hours before my flight. 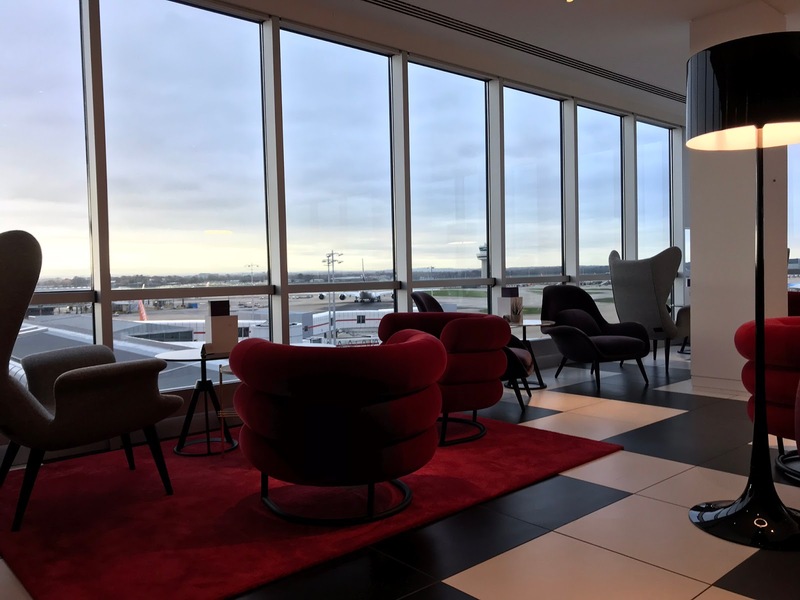 The clubhouse was bright, spacious and for someone who is quiet obsessed with planes and loves to just sit and watch them, the perfect views. I sat myself and one of the many free tables, there was plenty of choice as the clubhouse was large but also quiet, I think there was less than 15 people in there and within about 20 minutes most of them were gone. A few minutes after sitting down and getting comfortable a lovely staff member came and took my drinks order and left me to look over the food menu while she went off to get them, a cup of tea and a mimosa (well I'm on holiday and they're free so I was making the most of it) then I opted for the British breakfast which all went down very well, as I still had about an hour till boarding and I ordered another round of drinks and some fresh fruit, the service in there was wonderful, it was never long from my cup/glass being empty till I was asked if I wanted another drink, any more food, was everything ok? I really couldn't fault the clubhouse at all and I wish I could start every flight in there but sadly I am not a Virgin Atlantic Flying Club gold member or neither do I have the money to be flying upper class regularly, well let's be honest, it will probably be a long, long time till I get the opportunity again. Now on to the important part, on the plane. 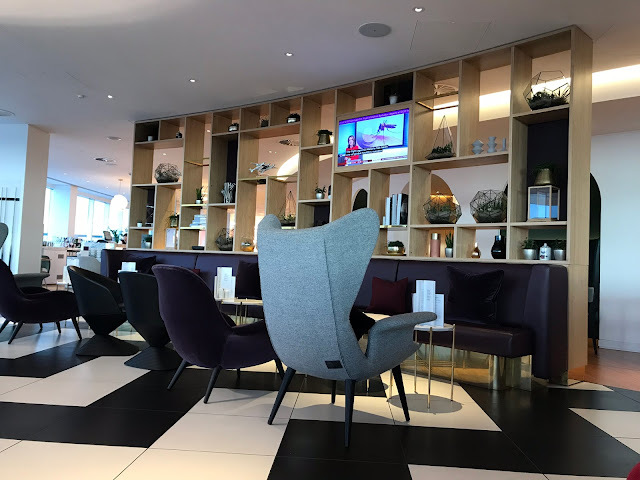 My flight was called for boarding and I headed straight off to the gate which makes a change for me but I wanted to make the most of every moment on the plane, I got to the gate and practically walked straight on thanks to the priority boarding that comes with flying upper class. 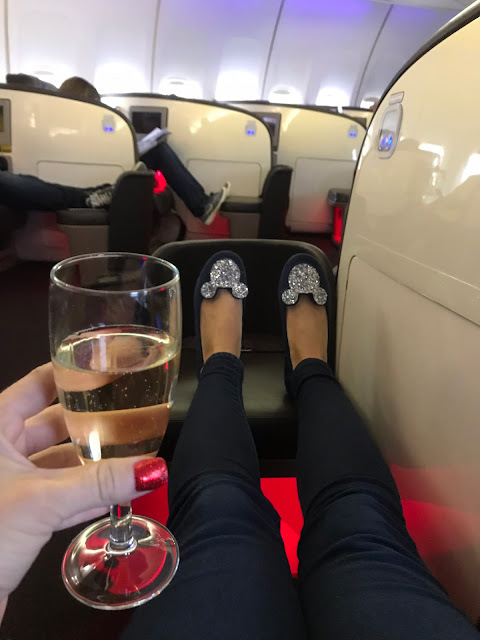 Once on the plane I was shown to my seat and offered a drink, of course I had to go for a champagne, anyone would think I was quiet a drinker with all this alcohol but I actually hardly ever drink but I'm celebrating right? the upper class section had just 12 seats (2 rows of 6) which made it even better as not only was the seat lovely and spacious, so was the whole cabin. As someone who is only 5ft economy seat pitch isn't really an issue but it definitely felt so much better not having a seat back a few inches from my face for 9 hours, the seats are much more manoeuvrable than in economy and premium economy, with buttons to move the seat in all sorts of directions, including a very comfortable recline, to be honest I could have easily have slept with no issues in the seat but this is all exciting and new, I wanted to test everything out so of course I had to have a nap in my 'bed' the lovely upper class cabin crew kindly switched my seat into a lay flat bed and I tucked myself in to the quilt, yes you read right, there's no flimsy red blankets here and I had the comfiest plane sleep I've ever experienced, I think being short had it's benefits once again here as I could easily lay down with no issues of my feet/legs dangling over any part of my bed. 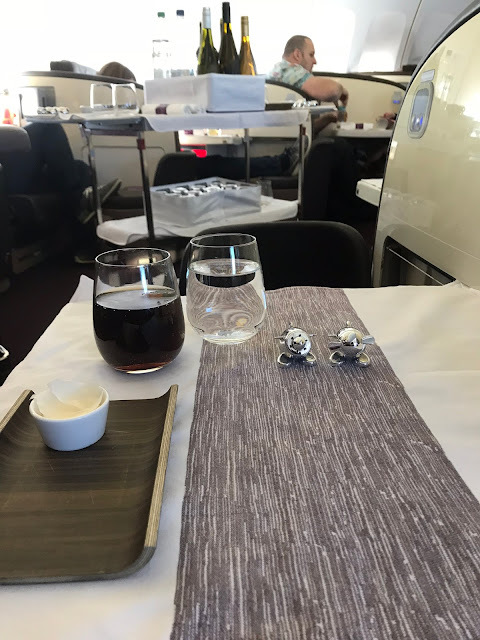 When it comes to food onboard you can expect differences there too, firstly rather than the standard pretzels (does anyone else love these?) 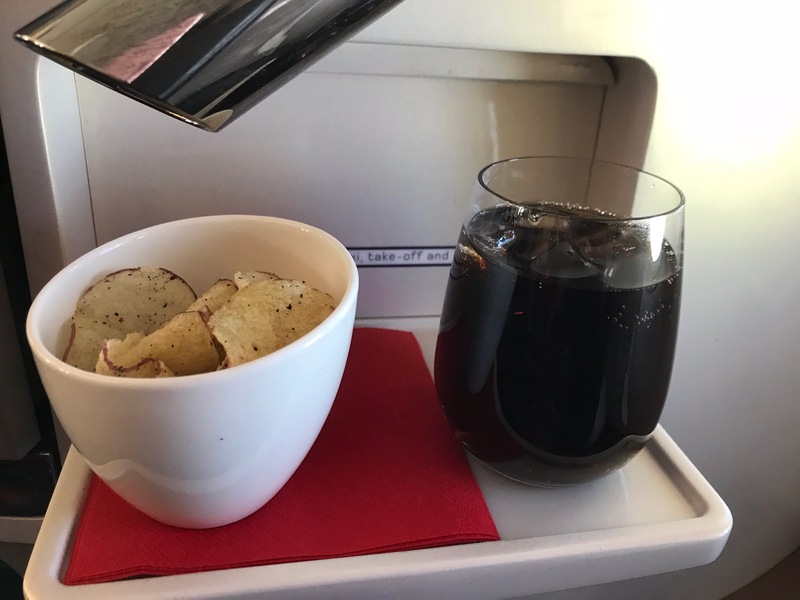 and drink in a plastic cup soon after take off, you get your drink in a proper glass and are given a bowl of crisps and throughout the flight there is a bowl of snacks such as crisps, popcorn, chocolate and fruit sitting on the bar for you to help yourself to as and when you please. My dining table was set up for me with a real knife a fork, yep no plastic rubbish in sight and of course, the infamous salt & pepper shakers. 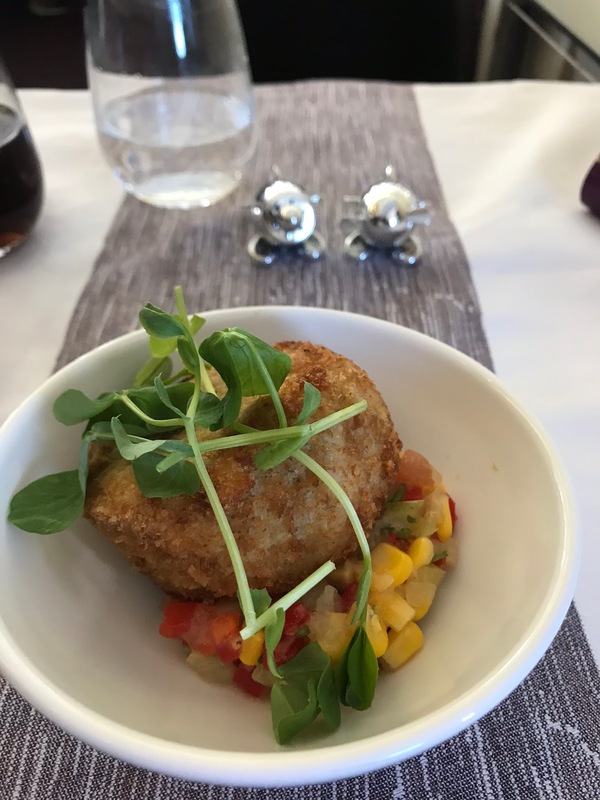 I'm not usually a fan of plane food, I'll enjoy it every now and then but not often, not amazing but it certainly tasted better than anything I'd eaten in economy or premium economy and definitely looked more appealing on a real plate rather than those plastic ready made style packages. As well as the 3 course dinner there was also a separate menu that you could order sandwiches, burger and other offerings until around 30 minutes before landing, this impressed me more than the regular dinner menu in comparison to the other cabins as I never have the afternoon tea offerings onboard due to not eating cheese and the sandwich always being cheese, this flight I got to enjoy a much fresher chicken sandwich, scones and best of all, A REAL CUP OF TEA IN A MUG! 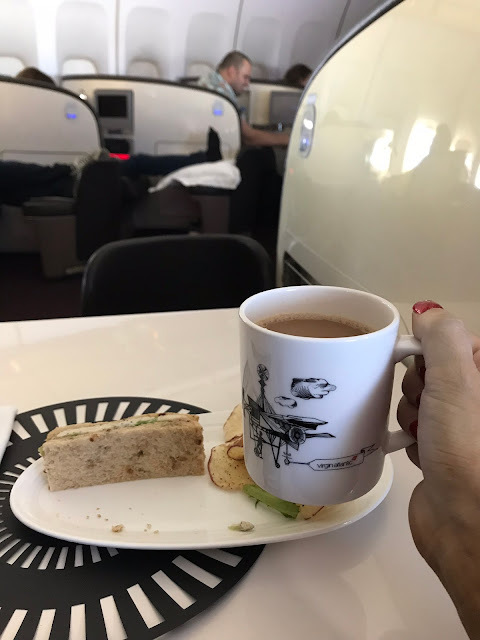 this was absolutely the highlight of my flight, as a big tea drinker and 9/10 finding tea on board flights awful I was so excited to be handed a mug with a teabag in, small things please me haha. I've hardly ever had a flight on Virgin with bad service, which is partly why I always chose to fly with them, the cabin crew are mostly so friendly, helpful and chatty and the crew during this flight were certainly all of those things, the air stewardess who was looking after me was wonderful, extremely friendly and always checking everything was ok or if I added anything and it definitely added another plus point to the whole experience. There was honestly nothing I could fault about my experience of flying upper class with Virgin Atlantic and in fact it was the first flight I didn't want to end and could have happily stay dup in the air a few more hours, if I had the funds it would certainly be my choice of cabin on every flight but until then, I guess it's back to saving up my flying club miles to do it all again. This sounds so fun! A upper class flight is definitely on my bucket list, too. I wonder when I'll get the chance!